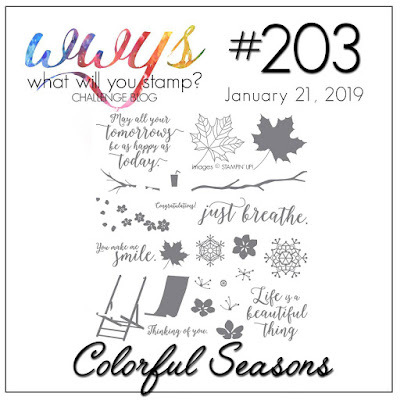 Playing along today with the challenge from What Will You Stamp? The challenge is to create a card the the stamp set from Stampin' Up! "Colorful Season". I thought I would make a modified eclipse card making my own background design with the small flowers in the set. They were randomly stamped with Mango Melody, Daffodil Delight and Flirty Flamingo. Then I stamped the stems for each one with Versamark, sprinkled with gold embossing powder and heat set. Next I cut the word "YOU" with the Large Letters Framelit Dies and used the Rectangle Stitched Framelits on all layers, including the gold foil sheet in the background. The center of the "O" was glued to 2 layers of Whisper White Thick card stock also die cut with the "O". This makes a type of chipboard. Finished with a simple sentiment from the "Jar of Love". This way the card can be for many occasions and I'll finish the inside when the right occasion arises and I need a quick card. Thanks for stopping by and for any Stampin' Up! product, just click on a link below to go directly to my online store!